Today we pay tribute to the 1,500 Irish civilians murdered by rampaging English Parliamentarian forces, during Oliver Cromwell’s controversial siege of the Irish port of Wexford. Many drowned whilst attempting to escape across the river in preference to being cut down mercilessly in the streets by the Lord Protector’s triumphant soldiers, who ransacked the place so thoroughly that it was even rendered unusable as winter quarters to Cromwell’s own troops. Ironically, this tragic event which would seal Cromwell’s place in World Infamy (and adjudge him Ireland’s all time Bogeyman) passed off while the tyrant himself ‘was still in his tent preparing his equitable reply to the governor [of Wexford] when all hell broke loose’, as the Irish historian Tom Reilly very recently noted. Indeed, even staunchly patriotic Irish authors such as Micheál Ó Siochrú now agree that ‘Cromwell did not participate directly in the storming of Wexford’. Unfortunately for Cromwell’s already fearful future historical reputation, but even more tragically for Wexford’s cursed population, the governors of this south-eastern Irish port had for so long facilitated its use as a money-laundering centre for local ‘pyrats who robbed the English’, that even honest Wexfordians benefited from regular illicit heists of ‘beef, pork, various grains, beans, salt , vinegar, butter … oil, sugar’ as well as expensive commodities such as ‘tar, cloth, whiskey, silver and bullion’, which ‘dissolved into the economy for a fraction of their worth’. As, by the late 1640s, even Dublin traders feared their ships might be hijacked by pirates employing a Wexford base, this gave the staunchly moral and God-informed Oliver Cromwell – then at the height of his military career – a perfect excuse to descend on this errant lawless community and pass his harshest judgement. That he was up to that severe task was – to the Irish Catholics of Wexford – shudderingly evidenced by his beheading of their divinely-appointed King Charles I just nine months previously. So when the Sack of Wexford occurred more through a mistake on the part of the port’s garrison commander than any positive action of Cromwell’s part, the reality of events clouded over and was forgotten, as the Myths & Legends of Ireland’s Arch Nemesis Cromwell commenced. 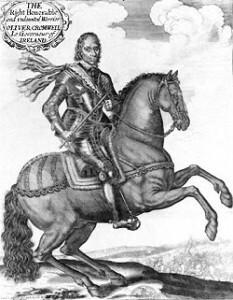 Even today, ludicrously exaggerated contemporary accounts – mainly authored by Irish clerics – continue to sustain Oliver Cromwell’s infamy throughout Ireland. Atrocities were attributed to him of which he had no part, even in places he did not go. He’s in the landscape, he’s in the dreamscape: he lingers deep in the collective mind. And yet, for a control freak such as Oliver ‘King Killer’ Cromwell, it’s surely a strange irony that it was not the execution of King Charles I, the bloody end of the Levellers’ Revolt nor even his infamous Seige of Drogheda which set our Lord Protector on the road to Irish infamy, but from his (perceived) actions during the Sacking of Wexford – probably the sole Parliamentarian atrocity that took place under his leadership over which he had no control. My dear old Mam was Irish and took me to see an exhibition about Cromwell. The last room was blacked out with one little lamp hanging over Cromwell’s death mask. I was four years old at the time. Rather than weirding the hell out of me my mother turned me into an instant mini historian. Quite a result . When you visit the Church in Downpatrick in County Down where the remains of St. Patrick are venerated under a stone outside the church; you will discover the remains of one of Cromwell’s son’s I believe or another relative in the wall of the nave of the Church! That is only fair as the bones of the Missionary should be no where near the accursed bones of any Cromwell. Tiochfaidgh Ar La! May the soul of Cromwell still burn in a hell of his own making.